Boxer Lab Mix - A Complete Guide To The Bouncy Boxador! 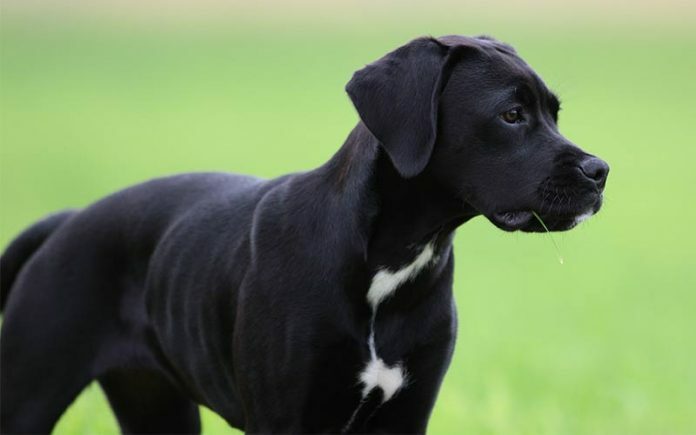 Home Breed Information Boxer Lab Mix – The Boxador! 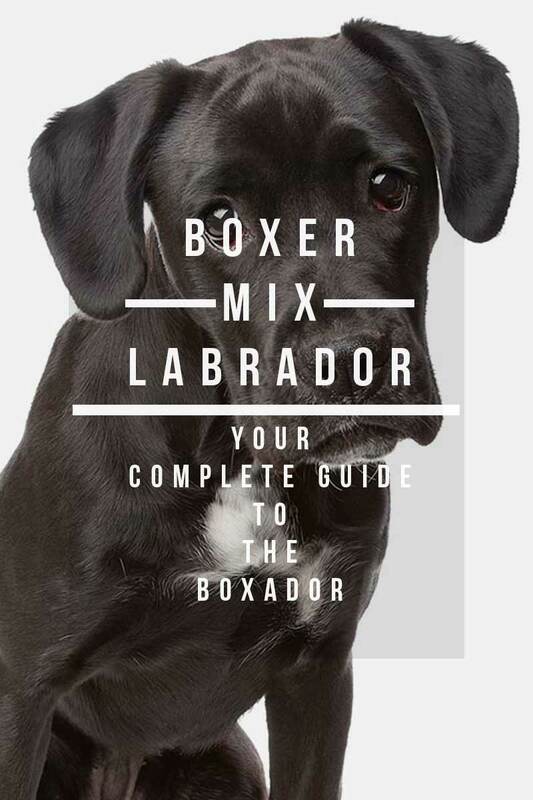 Welcome To Our Complete Guide To The Boxador. The Boxer Lab Mix. Boxers are playful and energetic. 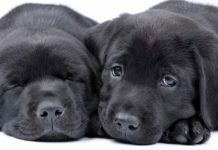 Labrador Retrievers are loyal and loving. Mix the two together and in theory you have a family pet that is always ready for an adventure, easy to train and a great companion. But are there disadvantages to cross breeding? Is it a good idea to create hybrid puppies? And what can you expect if you take home a Boxer Labrador mix puppy? 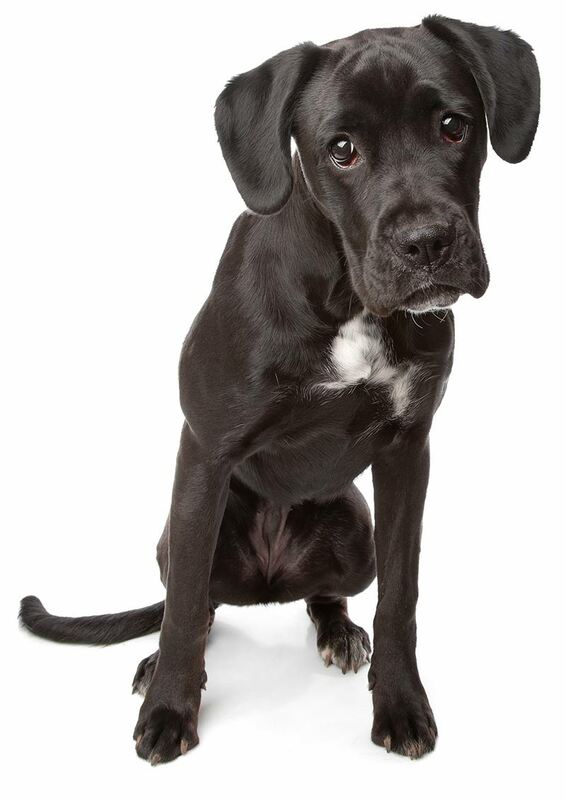 Read on for information about the Boxador, a Boxer Lab mix. From where to find Boxer Lab mix puppies to how to care for your Boxer Lab dog. You’ll also discover facts about the Boxador’s temperament, health and training requirements. What is a Boxer Lab Mix? A boxer lab mix, also known as a Boxador, is a hybrid of the Boxer and the Labrador Retriever breeds. The Boxador is an extremely popular cross-breed, which is perhaps not surprising given that its parents are both in the list of America’s top ten breeds. Labrador Retrievers have been America’s most popular breed for a record-breaking 26 consecutive years! Labradors are medium-sized dogs, with a lot of energy. They are extremely friendly and sociable, making them great family pets and happy to mingle as part of a pack. Boxers are athletic dogs that love games and fun. They are graceful and boisterous, with plenty of energy. Though recently, some concerns have been raised over conformational problems in the Boxer breed. Some people bringing home a Boxador for the first time will have found their new friend at a shelter or animal rescue center. It’s quite common for the family to fall in love with the mix so that when their dog comes to the end of his or her life, nothing but a Boxador will do. It’s important to point out at this point that cross-breeding is never an exact science. If you are opting for a Boxador puppy because you loved your last Boxer Lab mix and want another just like him, remember that the next one could be quite different. 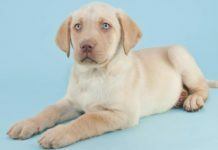 Although combining two breeds could gives the puppies traits from both parents, it can provide pups who take after one breed or the other instead. Regardless of the mix of your genes your pup ends up with, a Boxer Lab Mix dog is likely to be a medium to large dog, active, loyal, easy to train and very fond of challenges – of both the physical and mental kind! Given its parentage, a Boxer Lab dog is happiest with active humans. They require a lot of exercise and enjoy running around with the family or playing a game of fetch. Both Boxers and Labradors are usually great with older children. They are considered gentle giants and will eagerly run after little ones. Although they have been known to accidentally bowl over smaller family members in their excitement. It’s therefore important to supervise small children around them at all times. Boxers are instinctive guardians and proud to play the role of family protector. But you can reduce this through thorough socialization during the puppy stages and by meeting the Boxer parent and ensuring that they seem happy and confident around strangers. 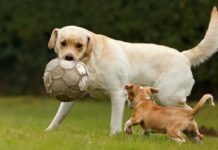 Labradors also love playing with canine companions, but Boxers are less reliable in this area. When they were first bred in 19th century Germany, Boxers were used as fighting dogs. Hence their puglistic name. To make sure your Boxador mingles well with other dogs, it’s important to socialize them from a young age to other dogs too. Finding them puppy friends to play with will encourage them to be calm and docile with other dogs when fully grown. One thing Boxers, Labradors and their puppies have in common is a willingness to work. Boxers in particular are working dogs. Used in World War I as a messenger dog, pack carrier and guard, these loyal pups are eager to be of use. Labradors also love to help their humans. They are often used as guide dogs for the blind as well as hunting companions and drug-sniffing dogs. Both Boxers and Labradors are very loving and loyal. Boxadors are extremely affectionate and will often behave as if they’re lap dogs. They think nothing of climbing on their people for a cuddle, despite their large size! With cross breeds it is often hard to predict which parent a puppy will resemble. But with Boxers and Labradors in the mix, it’s a safe bet that your Boxer and Lab mix puppies won’t be small. Boxers can weigh up to 80lbs and reach 25 inches tall. Labradors are similarly large. Boxador full grown tend to be between 23 and 25 inches tall and weigh up to 80lbs. Although females are smaller than males. When it comes to coat, the Boxer Lab mix usually takes after its Boxer parent. These mutts typically have short, smooth hair that sheds very little and is easy to care for. However if your Boxador has more Labrador in its genes you might have to deal with some shedding. Thankfully this is usually seasonal and can be kept in check with regular grooming. 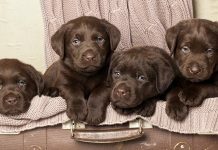 Labrador coats come in black, chocolate or yellow. Boxers are fawn or brindle. Often with white patches. Their offspring can be any mixture of these! The Brindle Boxador is a very common variety and these often have white markings. Genetic diversity is improved in a cross breed compared with the parent breeds and the coefficient of inbreeding (COI) is much lower. Many dog diseases are recessive which means that they won’t affect your dog unless he gets two faulty copies of the gene, one from each parent. The risk of this happening is lower if the puppies parents are not closely related. 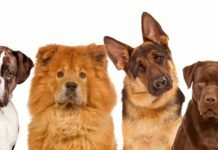 There are however, some health issues that are not recessive and can be passed on from just one parent, and there are common ancestors in some of our dog breeds that mean some diseases are present in both breeds. For that reason it is still possible that a cross bred dogs could inherit genetic health problems. So its important to be informed about health condition in the parent breeds and especially about common ailments affecting both Boxers and Labs. A 2017 study found that Boxers are one of the most likely breeds to get cancer. According to Petplan, mast cell tumors are the 5th most common illness in Boxers. And this breed is unfortunately also associated with heart disease. Aortic Stenosis is the most common major problem in the breed. Boxer Cardiomyopathy (ARVC) can cause heart failure and/or sudden death in dogs. The causes are not known but it is genetic and passed along certain bloodlines. ARVC affects males more than females and is most common in dogs older than 10. Symptoms include coughing, difficulty breathing and weight loss. Boxers can also suffer from Canine Degenerative Myelopathy. This is a neurodegenerative disease that can cause paralysis. One problem that is on the rise in Boxers is brachycephaly or ‘shortened skull’. This is due to breeders trying to exaggerate the breed’s characteristic facial features. It may be that being a Boxador rather than a purebred Boxer offers some protection against these diseases, it certainly reduces the skull shortening the we see in brachycephalic breeds. This is a bit of a two edged coin because while the Boxer physique may benefit from a longer muzzle, the Labrador physique is unlikely to be improved with a shorter one. Labradors are not without their issues too. This breed can suffer from hip dysplasia, a painful condition where the hip joint doesn’t form properly. It can cause lameness and severe arthritic pain. Another issue to be aware of in Labs is eye disease. Retinal dysplasia was first noted in the breed in 1959. 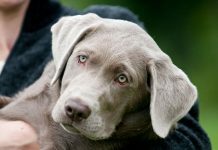 Only buy your puppy from a breeder who health tests the parents for all the potential problems their respective breeds could suffer from. To give your pup a long and healthy life, make sure he gets plenty of exercise, a balanced diet and regular vet check-ups. So in theory you can expect Boxer Labrador mix puppies to reach anywhere between 9 and 12 years old. A knowledgeable breeder will be able to give you some idea of the puppy’s personality, appearance and size once fully grown. Given Boxadors intelligent nature and working history, get started on training your dog right away. These mutts love to please and giving them positive reinforcement will create a bond between you that’ll last for life. Never buy from a dog from a puppy mill or pet store. Or from the back of a vehicle. Always visit the puppy in his own home in the presence of his mother, who should be relaxed, healthy and friendly. Sadly with any very fashionable breed, or breed mix, there are many out there who are just looking to make a quick buck. A good breeder will have documentation on the puppy’s parentage and health checks. You must to ask to see those certificates – they are very important. The parent dogs must have been screened for any genetic diseases and the breeder should be very forthcoming with any questions. There should also be a ‘waiting period’ after you get your puppy for you to take it to your own vet to confirm that it’s in good health. Adopting a shelter dog always comes with risk. Without documentation about the dog’s parentage and health, it’s hard to know what kind of pup you’re getting. But Boxadors in shelters need homes and rescuing puppies or older dogs can be very rewarding. Is a Boxer Lab mix the right dog for me? Only you can decide if a Boxer Lab mix is the right fit for your home. These are large dogs with big hearts that will give as much as they take. Boxadors love being part of a family. They are great with children and enthusiastic playmates for families with school age children and up. But this cross breed does require lots of exercise so if you’re not prepared to be active then perhaps it isn’t for you. It’s also a large breed that doesn’t do well in confined spaces. They are fiercely attached to their people and dislike being left for long periods of time. Boxadors who don’t get enough exercise or attention can display destructive behaviour such as chewing or scratching. This is a dog that suits a family with an active lifestyle and lots of love to give. They have a very happy and content disposition and will be the perfect partner in crime and cuddle buddy. 1 1/2 mo. Old and I named him Bruno, this is all without knowing he was a Boxador. Though it’s only been a short time he has learned a whole lot since. He is so eager to please me. He looks forward to his treats when I give him a command. I lost my short haired pointer last year and I was devistated. One day I was near the pound and a little voice said go check out the pound. So I did, as soon as I walked in there he was waiting for me. And sure enough I feel like he has my Nicos spirit. I’m completely in love. We got our Boxador, Molly, in 2004 when she was six months old. At that time, we were her third home. She is now getting close to 15 years old and nearing the end of her life. I’m tearing up right now writing about it. She has been, by far, the best dog I’ve ever had. She acted like a puppy until she was about ten years old, and she didn’t even really start to slow down until about a year ago. She has always been very headstrong and stubborn and aggressive with animals that didn’t belong like groundhogs or raccoons but gentle as could be with our cats or ducks or any other animal we had around. Our daughter was born when Molly was eleven years old, and even though Molly was starting to get a little cranky at that age she still tolerated the ear pulling and climbing very well. Our daughter is four now and very attached to Molly. I don’t know how I’m going to explain to her that in the near future Molly probably won’t be coming home anymore. Everything in this article is true. I can’t imagine a better type of dog. Bot is this information right on the money! We got our little lady ‘Boxador’ about three months ago from a rescue. We picked her out online at 4 weeks and picked her up at 8 weeks, right before Thanksgiving. She is BEAUTIFUL dog, leaning a little more toward the lab side. The prettiest brown eyes.. and that face! It was instant love. She made herself at home as soon as we got home! We have several acres for her to run around and play with her sister… (10 year old longhair mini dachshund). Though her sister is set in her ways and doesn’t always want to play! Which makes for some tense standoffs, lol. Talk about easy to train, our new addition to the family has been potty trained for the last 6 weeks! She’s SMART. And talk about playful! Can you say.. “she likes to bite!” lol. Oh it’s all in good fun and she is getting better now that some of her new teeth are starting to come in, but dang.. play time consists of biting, biting, nibbling, biting and biting some more!! Although she’s all but stopped biting our pant legs and shoelaces! And talk about loving! She’s a big baby! Lap dog anyone? She’s the SWEETEST dog we’ve ever had, she is a little-big love bug who who gets so excited to see us in the morning! She’ll start wining and barking ( just a little) at the bottom of the stairs to get us to come down when she hears us getting out of bed! We couldn’t be happier, she is a GREAT addition to our family!